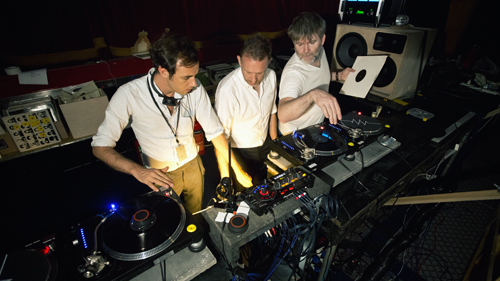 Despacio is the new project from DFA and LCD head honcho James Murphy, with more than a little help from his DJing buddies the Dewaele brothers, more famously known as Soulwax/2ManyDJs, and legendary New York studio designer John Klett. It's a club night dedicated to the maxim of good times and good music all experienced on a mammoth soundsystem, designed to truly surround the partygoer in an immersive experience that is often lost in traditional clubs and venues. How did Despacio come about? Is that what made you want to start this new project? Dave: “The original idea never came from, 'Let's build a soundsystem', it always came from 'Let's do a night where the three of us would DJ together, no one else just us', instead of what we do on a weekly basis, as in just showing up at a club that’s not necessarily set up to play the kind of music we play at Despacio, partially due to the soundsystem and partially due to the conditions. Just the culture of how things are in clubs today, where there will be a headliner and three other DJs or more. What is the technology that goes into the Despacio system set-up? John: “As little as possible, without getting too technical, the system uses up to eight “stacks” of speakers and amps. The stacks are crossed over into five bands so we have subs, bass, lo-mid, hi-mid and UHF. We went for McIntosh amplifiers for everything but the subs. The subs are bought-in units and we have two of those per stack. “The bass and lo-mid speakers are simple vented boxes with two 15” drivers in a roughly 10 cubic foot box for bass, and two 12” drivers in a roughly four cubic foot box for the lo-mids. The boxes are rectangular and the vents are not ducted — that means that the length of the vent is simply the thickness of the front baffle. The vents are larger in area and really follow a design paradigm that goes back to the earliest 'reflex' cabinets. The vent velocities are very low. The cabinets are 'tuned' lower than we are using them. I guess it’s a pretty loud soundsystem? John: “The goal is not about making the loudest system but as a byproduct of what we are doing, the system can get pretty ridiculously loud. I have measured some peak levels that are pretty high — I mean, look, we have about 10,000 watts per stack. Take out the subs, as they are their own universe. This leads to a pretty powerful and loud system. 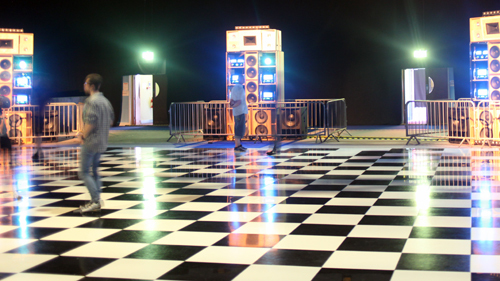 So has the soundsystem become the most important element of Despacio? How was the gig at the Manchester International Festival? 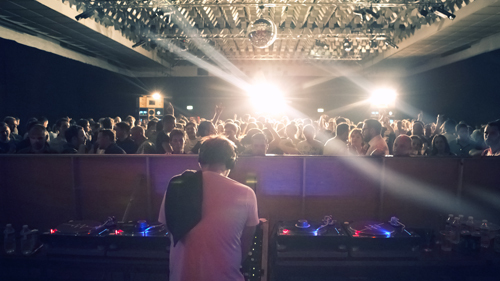 Where will you be touring Despacio next?